At Pierce, we don’t just meet safety requirements. We set safety standards. We offer nothing less than 360° Protection From Every Angle™. 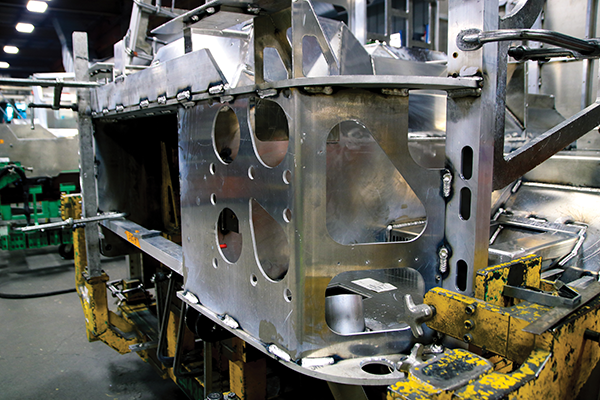 Pierce chassis are researched, engineered, tested, and built with industry-leading safety features and equipment. Some of these innovations are apparent while others are invisible, but all are essential. 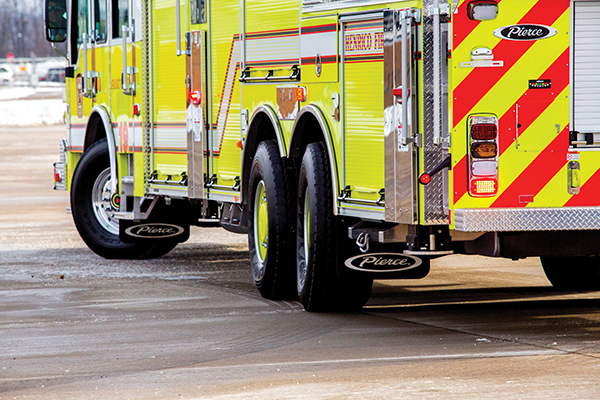 From bright exterior lighting to latching interior storage spaces and a mission-critical electrical system on Command Zone™ equipped trucks, Pierce fire trucks provide the safety to match their performance. Below are just some of the ways we ensure 360 degrees of protection. With no center post obstruction, the single-piece windshield opens sight lines and reduces risk of accidents with clear views of the road, pedestrians, and traffic. Available on Dash® CF, Enforcer™, Impel®, Saber®, and Velocity® custom chassis. 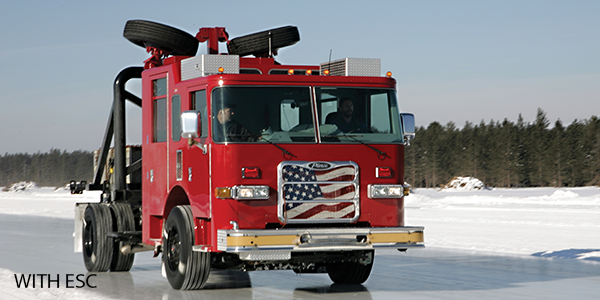 Pierce’s exclusive one-eleven mirrors make these chassis the only custom OEM fire trucks to meet FMVSS-111 visibility standards for school buses. They minimize body and head movements of the driver, and ensure the officer’s position does not interfere with passenger side mirror visibility. This positioning provides visibility to the front bumper as well as along the sides of the body, and narrows overall width of the vehicle by as much as 8". Pierce air-actuated steps fold out automatically when the door is opened. A large first step is provided as low as 16" from the ground. This makes cab exit and entry easier and safer, especially when suited up and carrying gear. The large-area step height is a consistent 16". And since the steps fold away automatically when the doors close, they stay clear of ice, snow, and mud. Available on Impel, Quantum, and Velocity chassis. 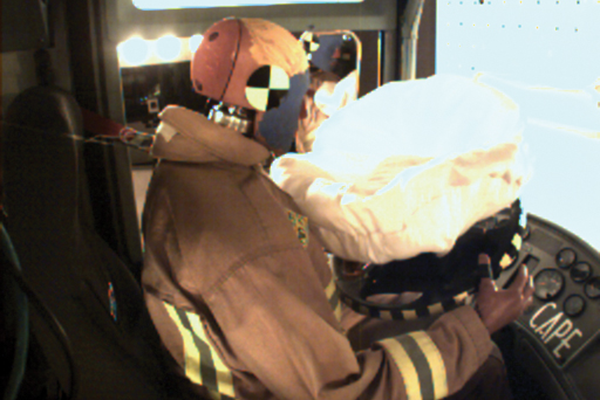 We’re never satisfied when it comes to occupant safety in Pierce apparatus. The logical evolution in 360 degree protection was the offering of frontal air bags – an industry first in custom chassis. We’ve thought of all passengers. 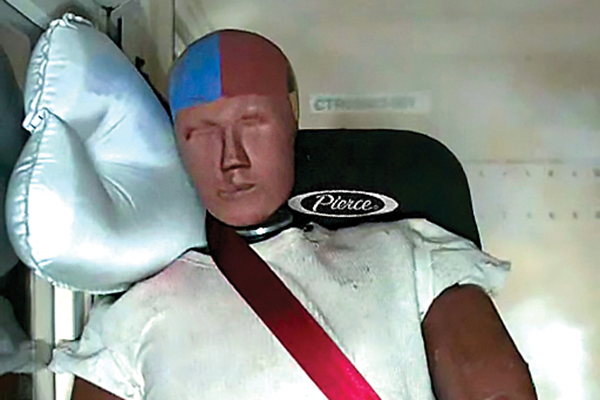 Our side roll protection system design was tested not simply for an average occupant but with crash dummies ranging from 5th percentile females to 95th percentile males. The evolution of our PS6® or PSV® seats allow for side roll air curtains to be fully integrated into the seating system rather than deploying from the wall, another first in the industry. And we’ve thought of possibilities which may never occur to you, unless you’ve been in a side roll yourself. A combination of high-pressure stored Argon and Helium is released into the airbag cushion when the small, pyrotechnic initiator receives a trigger signal from the crash sensor. Since the gas temperature is relatively low (below 180°F) and the cushion is non-vented (sealed), there is no risk of severe burns to the occupants. 360° Protection From Every Angle℠ starts with minimizing the risks of 90 degree side rolls. But it doesn’t end there. 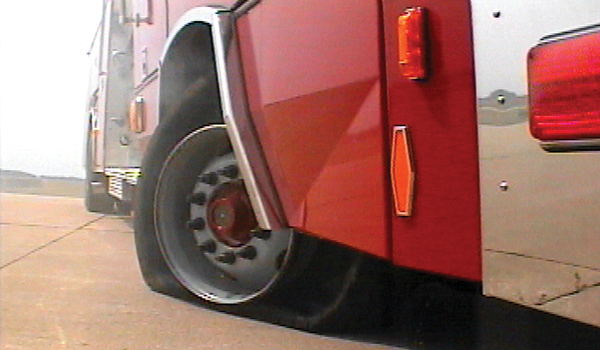 Side roll protection is default on Pierce custom chassis. Better information means better decisions. The Command Zone system delivers full diagnostic and industry-first prognostic capabilities through the only purpose-built-for-fire-apparatus interface. Connect up to five WiFi enabled devices. Review active and historic faults with text descriptions through a touchscreen sensitive enough for gloved hands. Check real time data transmission and receive auto alerts for maintenance intervals. Seat belt status. Virtual switch panels. Do Not Move Truck notifications. An entire suite of navigation, monitoring, and mitigation options. Command Zone is the easiest, most integrated, and robust link to optimal vehicle performance. First to bring the most important test to market. Every Pierce cab model is crash-tested to meet or exceed ECE requirements at the Center for Advanced Product Evaluation (CAPE), a division of IMMI. CAPE’s vehicle barrier crash testing facility has no equal, featuring a test lab, dynamic test sleds, static pull chamber, computer screen crash simulation capabilities, and the world’s only 90 degree rollover impact test machine. How rigorous is our testing? In addition to standard requirements, the Pierce Quantum passed a side strike test that wasn’t mandated to meet the ECE 29 standard. Our Velocity and Impel chassis passed twice the ECE 29 level of energy for frontal impact testing. And the Dash CF exceeded requirements by passing an additional roof crush at 5.4 times the ECE standards. 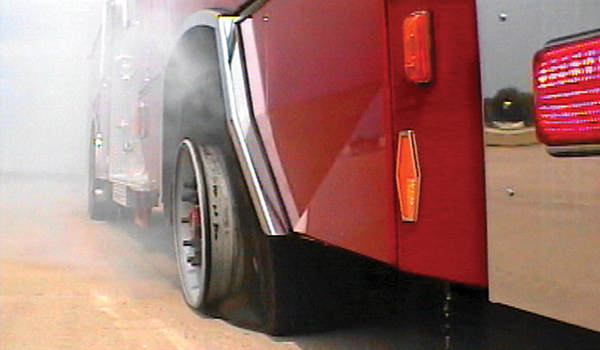 An automatic safety management braking system, Electronic Stability Control (ESC) enhances the directional and roll stability of fire apparatus during evasive maneuvers. Monitors lateral acceleration (cornering) of the vehicle & activates when the critical roll threshold is met. Automatically reduces engine RPMs, applies engine retarder (if so equipped), & selectively applies brakes to individual wheel ends of the front & rear axles to assist in bringing the vehicle back to its intended direction. Reduces the possibility of the vehicle rolling on its side. Monitors directional stability through sensors & compares the actual direction of the vehicle versus the direction you travel. Reduces the possibility of spinouts or driftouts, even in poor traction conditions. It starts with .25" aluminum welded to a .5" thick engine tunnel that is tied to the doorposts with a .5" thick semi-crosscar support, providing a rigid front that holds the cab together. This offers greater occupant protection in the event of a frontal crash plus greater shroud protection should an engine mishap occur. Add safety and space with the Pierce roll-up hosebed cover. It rolls forward, out of the way of the hosebed, for easier hose loading at the top of the truck. The solid cover protects the hose from all elements, and also provides an NFPA-compliant walking surface above the hose. The roll-up hosebed cover does not add to overall height as most aluminum covers do when opened. The first custom-designed, safer, and noticeably more comfortable seats in the industry, featuring built-in side roll protection. PS6 and PSV seats feature double-length seat belts and dual retractors that can be pulled quickly and comfortably over a firefighter in full turnout gear. The seats can also be retrofitted into many existing chassis. Dual seat belt retractors & double-length seat belts. 7.5° (PS6) & 5° (PSV) angles of recline. 17" cushion (front to back). Designed for walk-away use, the Pierce hands-free SCBA bracket is simpler, quicker, and safer. Inertia locks the bottle in place without the use of straps or levers. The bottle is released quickly and easily when you pull it from the holder. Resistant up to 30G, the bracket provides extra safety and security. The hands-free SCBA bracket can be retrofitted into many existing seats. SCBA bracket designed in conjunction with IMMI. 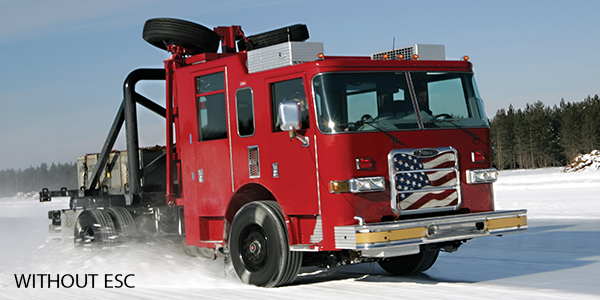 Pierce was the first custom fire truck manufacturer in North America to offer proprietary independent front suspension. TAK-4 Independent Front Suspension offers a 45 degree cramp angle, delivering a tighter turning radius, better handling, and more vehicle control. can be adjusted within 15 minutes. Pierce also offers TAK-4 Independent Rear Suspension as well as TAK-4 T3™, which combines the advantages of independent rear suspension with a 100 percent mechanical rear steering system for enhanced maneuverability. The Pierce Tire Pressure Management System uses sensors to monitor tire pressure and temperature and display them in the cab unit. Proper tire inflation reduces maintenance downtime, fuel costs, tire and tread wear, tire blowouts, tread separation, tandem axle tire wear, and heat related tire problems. Exclusive to Pierce in the fire industry, the Tire Blowout Protection Band features a safety band attached to a recessed drop inside the wheel. This prevents the tire from coming off the wheel during a blowout and assists the driver in maneuvering and slowing down in a safe manner. Even the smallest of features, like our VLH® caps, add an extra layer of safety for firefighters. When working with pressurized lines, VLH caps reduce risk of injuries caused by the inadvertent release of lines containing trapped residual pressure.